A clean dog is a healthy and happy dog. If you have never groomed a dog before, it may seem like a lot at first and maybe ever overwhelming; however, once you get the hang of it, it won’t be as overwhelming as it may seem. Knowing that your dog will be clean and healthy once each step is complete will be worth the great deal of time and effort. We have broken down some important dog grooming steps to help you create a checklist, and learn how to groom your dog properly. Today we are going to look at a few easy steps of grooming your dog before their bath time. Before you even give your dog a bath or start grooming, you will want to be sure that you have all of the tools you need at your disposal, otherwise it will be more chaotic having to run around, trying to find them. Short and smooth coat – brush once a week with a rubber brush first, then a bristle brush. Short but dense coat – brush once a week with slicker brush to rid of tangles, then use a bristle brush to rid of dead hair. Long coat – brush your dog daily to remove tangles and get mats out, then use bristle brush. 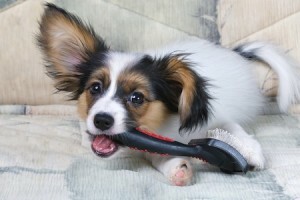 Tip: If you are brushing a puppy, make sure to give him or her little breaks in between brushing and bathing if needed. You want to encourage them to enjoy the process and not get overwhelmed. If you train your puppy at a young age, they will be able to tolerate grooming much better. If your dog has a mat that you cannot brush out, you may need to shave it off; however, please avoid using scissors, at it is more dangerous. If you are having difficulty shaving an unruly mat from your dog and don’t want to hurt your dog, make sure to bring him or her into a professional groomer. Also, mats that are close to the skin may get an infection underneath, so be sure to remove them as quickly as possible. If you think your dog may have an infection, you will need to bring them to the vet. Use dog nail clippers (human nail clippers are okay for puppies). Trim nails about 1/16 of an inch. Be sure not to cut too far or you may clip a blood vessel. If you accidentally clip it too far and it bleeds, use styptic powder or corn start to stop the bleeding. After clipping, use a nail file to smooth the nails. If you are interested in learning how to groom dogs to become a professional dog groomer, attending a grooming academy is the best place to start. Whether you want to be a professional dog groomer, or simply learn the best way to groom your own dog, we hope this blog has helped and we are always here to answer any of your questions!